MUMBAI: The festival of Makara Sankranti, also called as Thai Pongal by Tamils, is a harvest festival dedicated to the Sun which is usually celebrated every year during the month of January. Broadcast Audience Research Council (BARC) data suggests that on this occasion, Andhra Pradesh (AP), Telangana (TL) and Tamil Nadu observed high availability of viewers on TV on this day. The government declared a six-day holiday on account of Pongal celebration which led to additional tune in and growth in television consumption in TN. On the back of special programming aired on the general entertainment channels (GECs) in these languages, the two markets saw growth in terms of time spent by the audiences. In Tamil Nadu the average time spent (ATS) by viewers grew 14 per cent whereas in AP/TL it grew by 13 per cent. Backing it up with some more accurate data, the ATS in Tamil Nadu grew from 4 hours 37 minutes 11 secs to 5 hours 16 mins 26 secs on Total TV and in AP/TL, it grew from 4 hours 14 min 31 secs to 4 hours 47 min 7 secs. 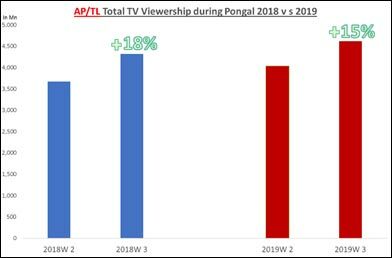 While comparing the viewership during the year 2018 as against 2019, during this festival, in TN/Pondicherry it raked in 15 per cent viewership as compared to 6 per cent in the year 2018 in week 3 as per BARC data. Meanwhile, the year 2019 wasn’t as great as the year 2018 for AP/TL in terms of viewership, because it observed a downfall from 18 per cent to 15 per cent in the week 3 of the BARC data. Talking about Tamil Nadu, the TV channels witnessed a 14 per cent growth primarily contributed by Tamil GEC which grew by 21 per cent with respect to previous week. Sun TV was the dominant player where its world television premiere, Sandakozhi 2, helped it garner 13731 impressions (000s). According to the FICCI Frames 2018, Southern state contributes substantially to the TV viewership when compared to the rest of the HSM (Hindi speaking market). Out of the total daily tune- in on TV of 566 million, 191 million viewership comes from South which is almost one-third of the total TV viewership of the country. The remaining 375 million viewership arises from the HSM. Talking about AP/TL, Telugu GEC channels saw 15 per cent growth in viewership. Telugu music and Telugu movies witnessed 13 per cent and 12 per cent growth respectively. Here, ETV Telugu ruled the roost with its special event—Sakutumba Saparivara Samethanga, with 7806 Impressions (000s). Not only this, South viewers have been active during Dussera and Diwali with 16 per cent rise in viewership while HSM has stayed almost unchanged with just 1 per cent rise in viewership. Kerala and TN markets are seen leading the country’s total viewership during Diwali with a rise of 32 per cent and 30 per cent respectively.